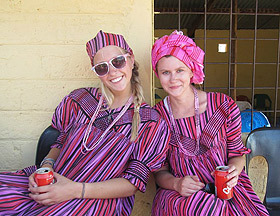 Katelyn Danelski '12 [right] spent the fall semester studying at the Center for Global Education center in Windhoek, Namibia. The following is her reflection on the experience, written after her return to Minnesota. "How was your trip," people ask me. "I hope you had a good time," they say. This past semester spent studying abroad in southern Africa with 14 other university students was so much more than just a "trip" or a "good time." It was a life-changing set of experiences. Homestays, speakers, traveling, classes, and conversations all took me and others to new places and perspectives on spiritual, geographical, and personal levels. It all began with ten days in Johannesburg, South Africa, where we had orientation and first met, then continued on to Windhoek, Namibia, where we studied politics, religion, history, and the "development process," and ended with a week in Cape Town, South Africa, where it was difficult to finally say goodbye. While we had many good times and experienced incredible travel, we were also challenged to think in new ways and challenged to wrestle with our own identities in regards to race, class, gender, nationality, and religion, among other things. We learned about apartheid and its legacy; we saw the legacy every day. We learned about education struggles, the wealth gap, HIV and AIDS, gender issues, Christianity's role in society, and "western" imposition. We learned about Owambo culture during rural homestays as well as how to pound mahangu (a millet used to make porridge) and cook over the fire. I left Namibia and South Africa with more questions than I had upon arrival. As is true of most people who study abroad, the experiences further molded my character and changed some of my ideas and understandings. It is the little things that stick out most to me now that I am back home. For example, the majority of Namibians and South Africans I met were very welcoming and always took time to have a conversation. The moment I entered customs at the airport in D.C. I knew I was back in the U.S., where interactions tend to be much more formal and fast-paced than what I'd been experiencing the past few months. The welcoming atmosphere and appreciation of time are aspects I hope to incorporate more of in my own life here. As far as change goes, I am much more aware of considering my "role" in places. What did it mean for me to study in Namibia? What does it mean for me to have had those experiences and now be back in Minnesota? I don't necessarily have answers for those questions, but I do know that it is important to continue to process them. My perceptions of southern Africa also changed. Africa, at least from most U.S. media and mainstream society standpoints, is seen as this homogenous continent with poverty and "Lion King" wildlife and scenery. But each country and city and individual person is different from the next. In Namibia alone there are several different ethnic groups, and everything from the capital city Windhoek to deserts, oceans, mountains, and a rich wildlife. I am grateful that many of my preconceived ideas were dismantled and replaced by real life—real people with real stories, and first hand images of Namibia. This gaining sense of reality is what has truly made a difference to my education. It is one thing to learn in a classroom about being open to others, but quite another to learn from others in their context. The people I met both through the program and otherwise will influence my take on life for years to come. Perhaps it is in the journey home that the journey abroad truly sinks in.